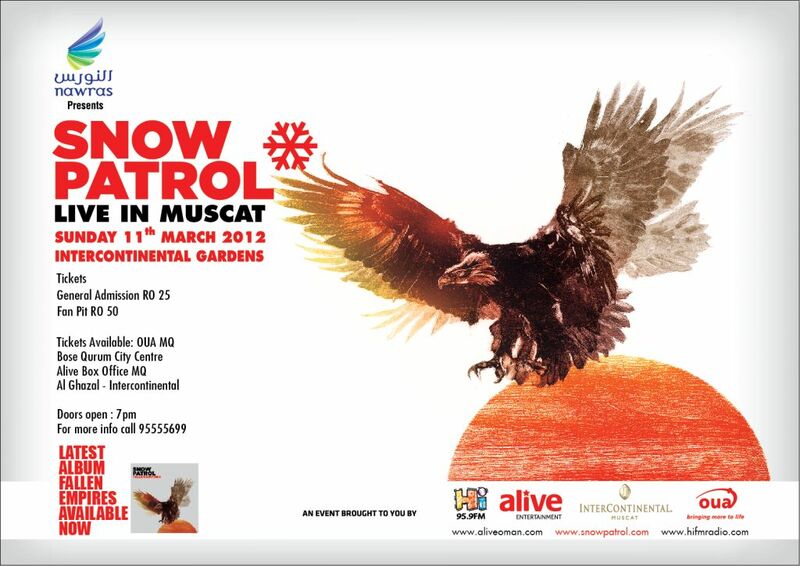 Alive events and Hi FM are once again putting Muscat on the musical map! This time, as regular readers of this blog, or listeners to Hi FM will already know, Snow Patrol are coming to town. Tickets are RO 25 for general admission or RO 50 for the fan pit - you can reserve tickets through the Hi FM website by clicking here, or you can purchase tickets (once they go on sale) at the Bose store in Qurum City Centre. You can get more info from the Facebook event page here. There is quite a commotion that this is a mid-week concert and that people have exams on that week - unfortunate timing I guess, but I still think the concert will prove to be very popular. As always, all you have to do to win the free tickets is email me at mrsythe [at] gmail.com or leave a comment here - if you leave a comment please make sure there is a way for me to contact you should you win! I'll announce the winner on March 4th, 2012 (thanks Gatvol)! I think you have my contact details! Ok, this time it's gotta be ME! Do I get 3 entrys now? I would love to see them on stage... playing one of my favorite songs 'Chasing cars'. Pick me so i can Set the Fire to the Third Bar!!! I am going to start chasing cars! Trying for the second time, may I win! if anyone has pictures of Al Sawadi, you can have a try for free tickets on Muscat Confidential too! so i have to win one also, who doesn't want a free one? I want to go so bad for this one! Snow patrol has been my all time favorites but due to my exams. My parents aren't purchasing me a ticket. If I get just ONE (and not the second one) pass I would be extremely grateful because I just. Can't miss this one out. Please help ! You can make a dream come true for me. Thankyou! THANKS Alive events and Hi FM for once again putting Muscat on the musical map!!! I hope i will be the one who will win the ticket. If I am the winner you can let me know by leaving a comment here..